When you start using an upgraded version of a piece of software, the first things you notice are the changes. It’s hard to tell whether they’re good or bad, but they’re different , and they take some getting used to. The next stage of the upgrade — and the one I’m now in with Tiger — is when you form judgments about the good and the bad (and, most often, the shades of gray) of new features, as well as appreciating small touches that originally escaped your notice. When Tiger was first announced last year, I wrote a series of articles under the name “Tiger Primer.” Now that Tiger is here to stay, I thought I’d revisit its features and provide a true hands-on judgment about what works and what doesn’t in this new version of Mac OS X. First up: Spotlight. Spotlight is, no doubt, the most important feature in Tiger. And it’s undeniably cool. It is going to change the way people use their Macs, and for the better. It’s miles beyond any of the old search features in the Mac OS — yes, I’m looking at you, Sherlock. And yet, oddly enough, Spotlight is also the Tiger feature that I feel the most ambivalent about. As cool as Spotlight is, it’s still a first-generation technology that’s got a bunch of quirks, some mildly annoying and some absolutely maddening. In addition, Apple has generated a list of “common attributes” to be shared among various programs. Instead of each application coming up with its own definition for “Author,” there’s one definition. Why is this cool? Because you can do a Spotlight search for documents by a particular author, or images of a particular size. (You can do it today, if you’ve got Tiger. Type Command-F in the Finder, then change Last Opened to Other. From the following list of attributes [and see how many of them there are! ], choose Authors and click OK. Then type the name of someone you exchange Microsoft Office files with.) To see this extended information, select a document and choose Get Info in the Finder, then see what’s listed in the More Info section. In the past, Apple has added awesome new technologies to Mac OS X, but made the act of using them so obscure that only programs from Apple ever got to use them. Spotlight, in contrast, is remarkably open. Developers can write plug-ins that let Spotlight scan its files, and can use Spotlight to add search features within their own applications. 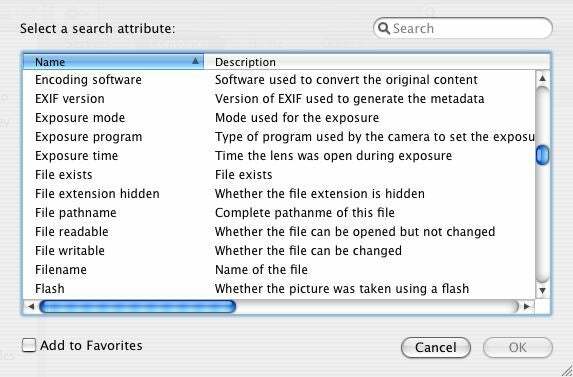 Spotlight on files. However, Spotlight’s also got a major limitation: at this point, it’s strictly a file-by-file technology. This means that e-mail programs that save each message they receive as an individual file (it’s no coincidence that Apple Mail does this) can take advantage of Spotlight, while ones that don’t (Mail competitors Entourage, Eudora, Mailsmith), can’t. Smart Folders are smart. An outgrowth of Spotlight into the Finder, Smart Folders are going to dramatically improve Finder productivity for a lot of Mac users. When Macworld editors mailed me the stories they were working on, I used to have to label their e-mail messages and remember to read them later. That didn’t work well, so I started dragging the attachments, one by one as they arrived, into a “to be read” folder. That didn’t work so well either. Now I have a Smart Folder on my desktop that handles the entire process: it looks in my attachments folder for Microsoft Word documents received in the past few weeks which contain a few tell-tale Macworld attributes. The result is a folder that automatically contains stories I should read, but one that never becomes unmanageably large. Queries aren’t always so smart. However, in building my Smart Folder I discovered that an annoying Apple design trend from iTunes has made its way into Spotlight as well: an oversimplified search interface that prevents you from doing even somewhat complicated searches. Want to create a Smart Folder that contains all Microsoft Word files modified in the past 14 days with either a name that contains “22” or “23” but not “21”? You can’t do it, just as you can’t (without faking it via using other playlists as intermediaries) create an iTunes playlist that isn’t either all “and” or “or” operations. I will admit that some users won’t even think of making these kind of searches. But they’re also very powerful — and many users would appreciate having that power at their fingertips. It’s past time for Apple to design an easy-to-use interface that also lets users harness the power of or and not . , it will actually search for documents containing super , bowl , and either chimpanzee or orangutan . And apparently Spotlight itself can handle more complex queries — it’s just that the Apple-built interface doesn’t expose any of that complexity. John Siracusa’s excellent Spotlight critique at Ars Technica has the details, along with an encouraging suggestion that it’s only a matter of time before a sharp Mac developer creates a super-duper expert search tool for Spotlight. I can’t wait. I hate that spinning beach ball. You know the one. The spinning beach ball, also known as SPOD, the Spinning Pizza of Death. I see it a lot more in Tiger than I did in Panther, but the biggest offender — by far — is Spotlight. Sometimes Spotlight shocks me in just how fast it really is. Other times, I’ll start to type something… and find myself waiting for a half a minute while that beach ball does its thing. In conclusion… I like Spotlight. Yes, it’s got a bunch of rough edges. Yes, it hasn’t reached its full potential. But what’s already there in Mac OS X 10.4.0 is pretty impressive, and I have the feeling that it’ll only get better. If Apple can address Spotlight’s inability to query databases and design an “expert search” interface for the geekier among us, I’ll be happy. In a year I’d expect that the general consensus will be that Spotlight is the most important feature ever added to Mac OS X. If you deal with an avalanche of files, be they Word documents, images, or something else, Spotlight will make upgrading to Tiger worthwhile all on its own.